If you were planning to get a tattoo and were wondering what you should get for yourself, you should try and get something that would be an extension of your personality. Assuming you are a geek and love video games, why not get a tattoo that reflects what you like amongst games? In fact, there are thousands of people who have been getting tattoos inspired by their favorite video game, favorite console and even favorite video game characters. With that in mind, you really should take a look at all these cool and awesome tattoos which would make any video game fan go gaga. So without further introduction, here is an awesome collection of 18 Cool Geeky Video Game Tattoos inspired by the greatest gaming characters, consoles and games featured on different body areas. Super Mario Brothers could be hailed as a great game that is almost a legacy of the 80s. Even to this day, youngsters and adults love the game equally and there have been several fan merchandizes as well. 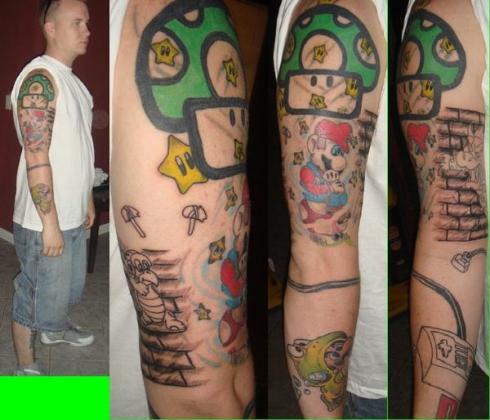 These Super Mario Tattoos stand as testimonies to the game’s popularity. 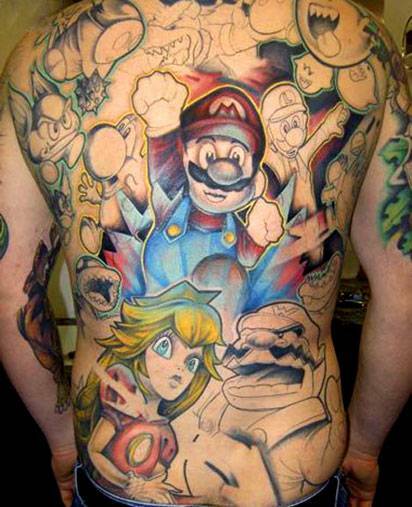 This Super Mario Back Tattoo could just be what the doctor ordered, if you like complex but defining tattoos. 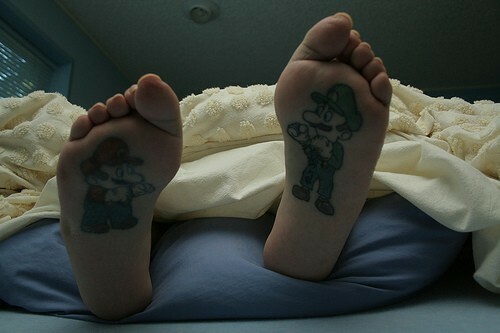 If you like both Mario and his brother Luigi, you must get the Super Mario Brothers Feet Tattoo, so they are always together! If you are a little adventurous, you could get Super Mario Brothers Sleeves tattooed and making so visible to all during the Summer. 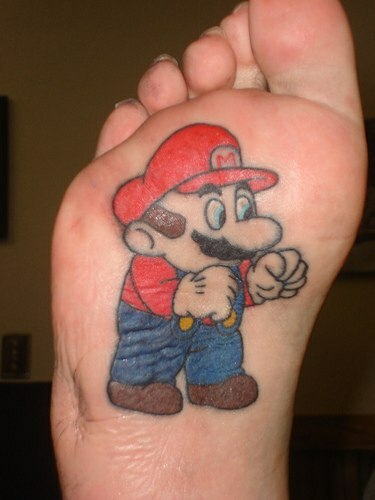 The Super Mario Sprite Tattoo is something that any self-respecting Mario fan would get for himself or herself, though it is a little shocking, and you must be a Mushroom lover. 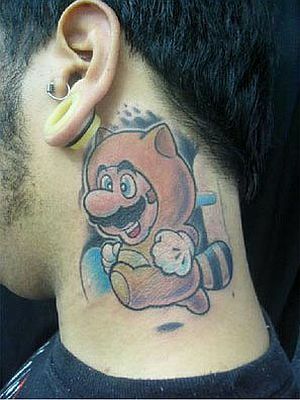 If you can withstand the pain and agony, try and get a Simple Super Mario Racoon Tattoo which depicts the Tanooki Suit from Super Mario Bros. 3. This Geeky Ms. Pacman Head Tattoo must have hurt her a lot, and why would anyone think of inking on their temples? 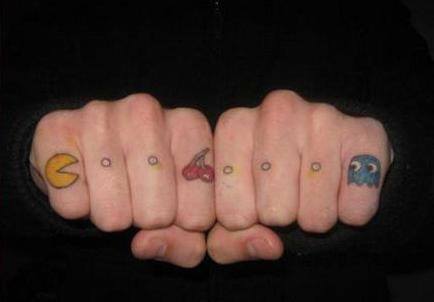 A Geeky Pacman Knuckles Tattoo inked on the most improbable of places, yet it is highly intriguing. Another popular game form the 80s, Tetris has continued to inspire designers and artists as well. A lot of products have been inspired by Tetris like the Tetris chair, table and even Tetris clothes. 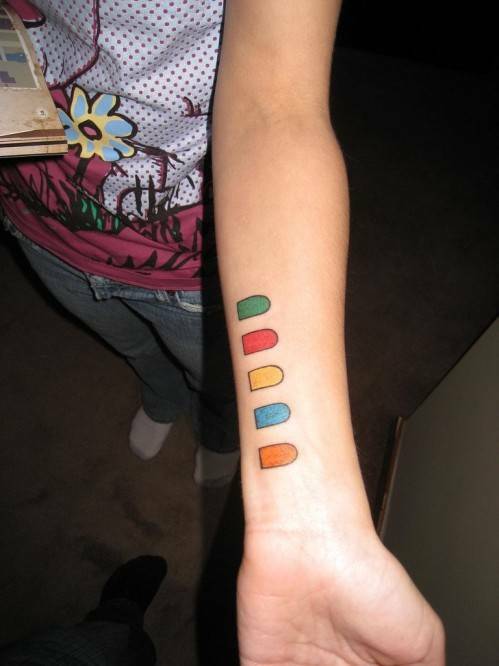 These Tetris tattoos indicate the popularity of the game even in the new millennia. 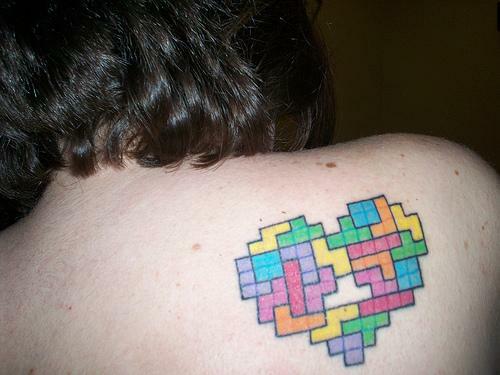 This cute I Love Tetris Tattoo has been inked in the shape of a heart. 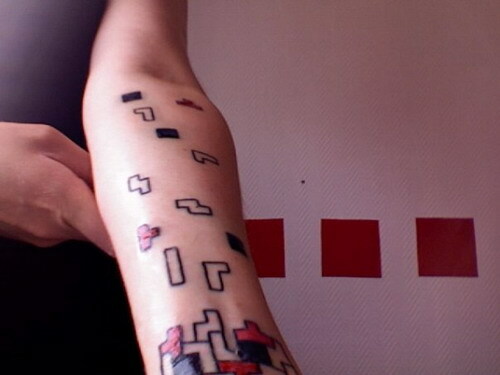 This Cool Tetris Tattoo looks like it has blocked the wearer’s hand, for there are Tetris blocks all over the person’s forearm! Video gaming would never have been the same without NES. 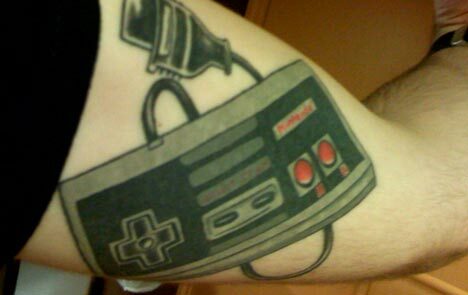 This cool handheld console kept us all busy during our childhood and this amazing NES Tattoo pays homage to those days filled with fun. What could be better than playing music on your console? What could be better than jamming with friends when they come over? It is no secret that Guitar Hero is one of the most important games of this decade. Go ahead and get a tattoo which is an extension of your personality. In this case, get a Guitar Hero Tattoo along with your favourite musician or band’s name as well! Nintendo is one of the biggies out there, and thanks to them we had the NES and now the Wii and DSi. If you love your Wii, or DSi, I am sure the least you could do is to get a tattoo of Nintendo or its products on your4 body. This Nintendo Logo Tattoo is just right for any Nintendo fanboy or fangirl. 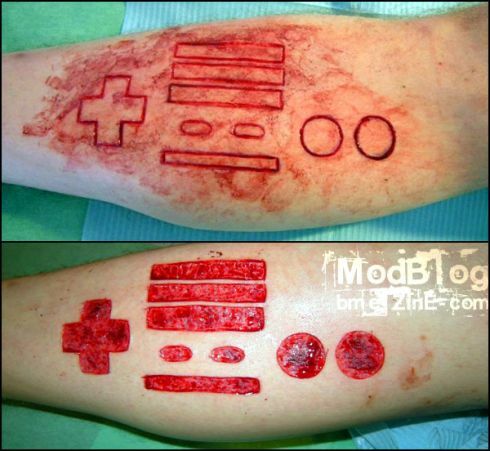 If you are up to it, you could go ahead and scar your body, just like someone with a brave heart did in the Nintendo Controller Scarification Project. It is no secret that Ryu is one of the most good-looking video game characters we have seen. 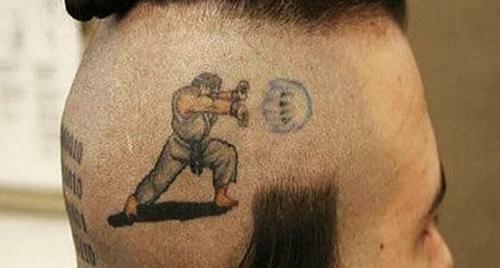 If you like him enough, you could get a Ryu Tattoo similar to this one here. 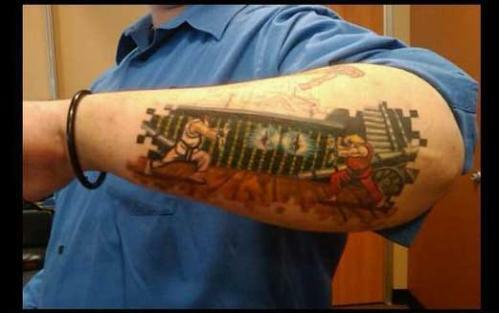 You could also take a look at this amazing Street Fighter Ryu Scene Replica Tattoo, which is amazingly realistic. After getting everyone saturated with his cuteness, Sackboy has now begun to become popular among tattoo artists. 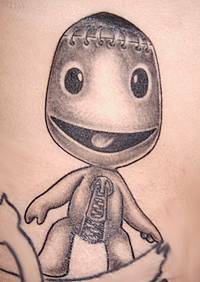 If you are up to it, you could get a Sackboy Tattoo yourself! Tattoos and getting tattoos done can be addictive. If you get tired of the one you have right now, you could get another in a different place or you could get the tattoo removed through laser treatments. The bottom-line is, tattoos allow you to show the world who you are, and what you believe in the most.